One of the things that people who are beginning to use self hypnosis often say to me is that they are worried they did not enter into hypnosis because they were expecting to be in a complete state of oblivion, losing total awareness of everything that was going on around them. I imagine that this is where some people's fear of losing control while in hypnosis comes from. In reality there are many levels of consciousness that individuals experience when in hypnosis. It is true that (usually) with a lot of practice with self hypnosis, or if you were having a session in my office, then you could enter a very deep hypnotic state in which your attention of focus would be completely inward and not on your external environment. However, for most people during self hypnosis, and for when working with me in my office, awareness of the external environment will remain. I explain it to clients that it is as if they were lying by a swimming pool or lake on a hot day with their eyes closed, just being with their own thoughts or "zoned out" as we say. Some part of your mind is still likely aware that there is a gang of kids splashing about in the shallow end and another group over on the grass playing Frisbee but we just don't care. May be you are choosing to focus much more on the feeling of the sun on our skin, or the fragrance of the summer flowers around us, etc. For much good work to be done "depth" of hypnosis, or the subjective experience is not the goal. The important thing to remember is the outcome of the process,the result i.e. what happens after the sessions. 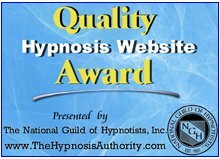 Many experienced hypnotist will confirm that people can have both surface and deeply internal hypnotic experiences and that both states produce positive results. It is the result that matters and not necessarily the depth of the hypnotic state that is the determining factor in this regard. The more important thing to keep in mind is the power of self hypnosis. The more you allow it to work and expect it to work the better your results will be. However, for those who insist on wanting to know more about the "depth" of hypnosis that they experience here is an easy way to measure it for yourself. With a little practice this method becomes very reliable. I should note that this method is for self comparison only. It is OK and can be useful to use it to measure your own progress but is not designed for two people to compare their results. The method works because of course the subconscious mind knows the depth of hypnotic state that it is in. The goal of this method is to bring that information into the conscious mind. Here is how to do that. While you are in hypnosis, imagine a measuring scale that looks like a yardstick. Measured out along the vertical yardstick is a scale marked from 1 down to 20 and next to the scale is a movable arrow that can point at any one of the numbers on the scale. The numbers themselves represent your hypnotic depth. Now whenever you wish to measure your depth, picture this scale in your mind's eye. Imagine it in a vertical position with its pointer free to float up and down the scale. It will be helpful to imagine the pointer as having a very "springy" or bouncy action at first prior to its finally coming to rest on some number on the scale. This number indicates the depth of hypnosis you are now in at that moment. To measure effectively do not consciously pic a number at which you think the pointer should stop. Just imagine it bouncing up and down until it slowly settles on a number of its own accord. Practice this a few times and you will end up with a reliable and valid result each time. I want to end up on this brief look at "depth of hypnosis" with the reminder though that the actual depth of hypnosis is nowhere near as important as regular and correct practice. Persistence leads to desired results.